A political stalemate over the president’s border wall plan makes small-bore immigration fixes more remote. In 2015, the year President Trump launched his White House bid with a promise to build a wall on the Mexico border, illegal migration to the United States plunged 31 percent, falling near its lowest level in 50 years. Security experts saw a success, but Trump looked at the border and saw something ominous: “rapists,” “criminals” and other predators lurking on the other side. In 2017, Trump’s first year in office, he continued to insist on the urgent need for a border wall, even as illegal crossings dropped further. With parts of the federal government shut down over what has morphed into the defining symbol of Trump’s presidency, administration officials are clamoring louder than ever. Only this time, they face a bona fide emergency on the border, and they’re struggling to make the case there’s truly a problem. Record numbers of migrant families are streaming into the United States, overwhelming border agents and leaving holding cells dangerously overcrowded with children, many of whom are falling sick. Two Guatemalan children taken into U.S. custody died in December. With both sides entrenched, there has been little bipartisan urgency to examine the relatively narrow set of legal and administrative changes that could potentially make a difference in slowing illegal migration or improving conditions for families who arrive at the border. Democratic leaders, pressed by liberal groups and immigrant rights activists, have dug in against Trump, accusing the president of pursuing a xenophobic agenda and throwing a “temper tantrum,” in the words of Senate Minority Leader Charles Schumer. The risk of a prolonged stalemate is increasing as the wall fight becomes a referendum on the president, leaving little space to negotiate changes to the lesser-known statutes some administration officials see as the key to stanching the border surge. “This is the triumph of symbolism over policy solutions,” said Tamar Jacoby, a conservative who serves as president of ImmigrationWorks, a federation of small businesses that advocates for immigration reform. The impasse marks Washington’s latest failure in over nearly three decades of trying to reach consensus on a comprehensive overhaul of a massive immigration system that both political parties agree is largely broken. There are an estimated 10.7 million undocumented immigrants living in the United States, according to a recent estimate from Pew Research Center, and there is no political consensus over their future. Trump’s most recent predecessors, Republican George W. Bush and Democrat Barack Obama, supported unsuccessful bipartisan legislative efforts. Current White House aides acknowledge privately that a wall will not adequately address the record surge of immigrant families at the border — most of whom surrender to authorities in hopes of winning asylum protections. Last year, the Trump administration opposed and helped defeat a bipartisan Senate plan that would have provided $25 billion for the wall in exchange for a path to citizenship for up to 1.7 million young undocumented immigrants. The president put his support behind a more conservative bill that would have amended “loopholes” in immigration law, allowing the administration to detain families for longer periods and speed up the huge backlog of asylum cases. But that plan, which also included massive cuts to legal immigration programs, was soundly defeated, as Democrats opposed rolling back protections for immigrant families. Since then, Trump has attempted to use executive powers to tighten immigration rules, but during the summer he ended his administration’s policy of separating migrant children from their parents amid political backlash. Federal courts have blocked other hard-line measures from the administration, prompting Trump to focus on the border wall. During a news conference Friday, Trump discussed ways to seize private land for the project, waxed on about the merits of a barrier made of steel instead of concrete, asserted falsely that Mexico would pay for it through a new trade agreement and repeated his warnings of terrorists at the border. But he only briefly alluded to the humanitarian crisis, suggesting a wall would be the solution by dissuading women and children from attempting a dangerous journey. If they “know they can’t get through because we have a great border wall or fence or barrier, they’re not going to come up and you’re not going to have the problem,” Trump said. In recent weeks, so many parents with children have been among the 2,000 unauthorized migrants who are being taken into federal custody each day that authorities have resorted to mass releases of families onto the streets of El Paso and other border cities. 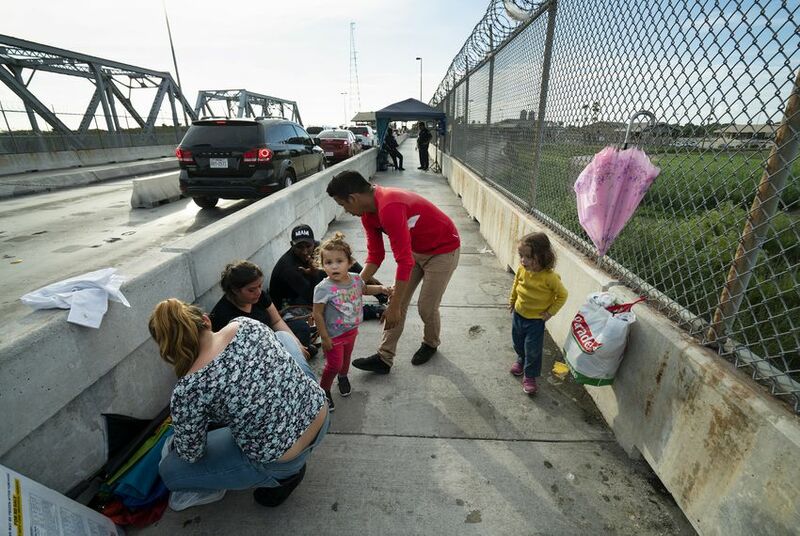 U.S. agents are bringing dozens of migrants coughing and feverish each day to clinics and hospitals after stays in jam-packed holding cells where children sleep on concrete floors and huddle in plastic sheets for warmth. A group of Democratic lawmakers led by the Congressional Hispanic Caucus will travel to New Mexico on Monday to the Border Patrol station where 8-year-old Felipe Alonso Gomez was detained before he died on Christmas Eve with flulike symptoms. But Democrats critical of the administration’s treatment of migrant families have offered few solutions to stem the unprecedented influx of parents with children that is buckling the U.S. immigration system. The government shutdown has made the strains worse. Many immigration judges have been furloughed, deepening dysfunction in a court system crippled by a backlog of nearly 1 million cases. Along the border, U.S. agents and officers are being forced to work indefinitely without pay. “Morale is down in the dumps,” said one border agent in South Texas who was not authorized to speak on the record. Yet in Washington, the president has continued to sound the alarm for a border wall, appearing at the White House on Thursday with representatives of the Border Patrol union to make another pitch to reporters. Adam Isacson, a security analyst at the Washington Office on Latin America, said there appears to be little political incentive for conservatives to hash out a deal if it doesn’t deliver on Trump’s signature issue. With Trump eyeing a reelection bid amid increasing pressure from his conservative base, the debate over the wall could dominate Washington for the foreseeable future. “They are stuck on this wall thing because of its emotional appeal,” he said. How does the government use eminent domain to seize land from Texans?